Biologists have classically studied the effect of species’ surrounding environment on their evolution. But the variation within species that is generated by natural selection and other mechanisms may also affect that very environment. Recent studies have shown that different intraspecific variants may have ecological effects that are as distinctive as those of separate species. Evolutionary and ecological processes were for a long time thought to operate on vastly different time scales. For example, speciation may take thousands or millions of years, whereas population dynamics occur over tens of generations. Yet, by the early 2000s, studies were showing evidence of rapid evolution – not just in viruses and bacteria, but also in fishes and trees. A pivotal paper by Hairston et al. (2005) coalesced an emerging set of ideas (i.e., Thomspson 1998, Hendry & Kinnison 1999, Yoshida et al. 2003) suggesting that evolutionary and ecological events could occur concurrently, and thus, affect one another. Motivated by Hairston et al. (2005), many ecologists and evolutionary biologists began to focus their research on how the variation within species generated by recent evolution affects communities and ecosystems. 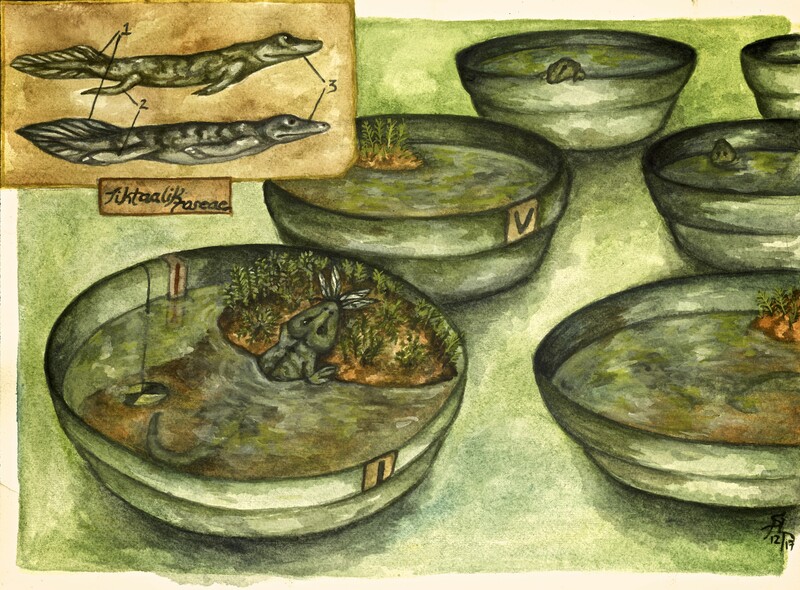 Their experiments illustrated how recently evolved differences in phenotypic traits within species (intraspecific variation) could differently impact the ecological surroundings. In 2010 a group of these ecologists and evolutionary biologists recognized that they had been asking similar questions about intraspecific variation in their different systems. All were broadly interested in the ecology of rapid evolution– but some had begun their careers studying the mechanisms by which adaptive traits evolved, and others on the broader role of these traits in ecosystems. Across their diverse systems, the researchers were revealing the ecological importance of trait variation within species. In most systems, the researchers found that this intraspecific variation directly affected the composition and abundance of organisms at adjacent trophic levels – the different forms of these traits affected what their bearers could eat and what could eat them. Sometimes, intraspecific variation indirectly effected organisms at more distant trophic levels. At first glance, the experiments that they were running seemed very incongruent with one another: studies on flowering plant species like cottonwood showed that different noxious leaf chemicals deterred alternate communities of herbivorous insects. Studies on freshwater fish like threespine stickleback demonstrated that incipient speciation and specialization of feeding traits like gape size resulted in the removal of certain planktonic prey from lake ecosystems. Our meta-analysis results from conversations that started within this group of researchers in 2010. The group’s goal was to understand more generally how variation within species impacts communities and ecosystems. Because organisms interact with their ecological surroundings through their phenotypes, we include experiments that examined variation in physical, behavioural, chemical, or phenological traits regardless of known genetic underpinnings. Our meta-analysis brings together the first generation of studies demonstrating the incredible ecological consequences of the diversity displayed within species. Collectively, we show that variation within species is often as ecologically important as variation across species. Sometimes, replacing individuals from one population with those from another of the same species elicited as strong an ecological response as removing those individuals entirely. Although the ecological effects of variation among species is on average larger than the effects of variation within species, this is neither consistent across experiments, nor species. Of the 25 studies we included, however, most examined ecological effects of intraspecific variation in freshwater fish or terrestrial flowering plants. Very few studies focused on single-celled organisms, mammals, amphibians, reptiles, non-vascular plants, marine, or non-temperate systems, and none of these studies met the inclusion criteria for our meta-analysis. Our goal is thus to inspire ecologists and evolutionary biologists to examine ecological effects of intraspecific variation in their own study species. Further, we hope to draw attention to the conservational importance of preserving variation within species in order to maintain the structure and function of threatened ecosystems. I personally would study the intraspecific ecological effects of a transitional fossil species, like Tiktaalik. At some point in the Devonian individuals in this species must have varied in their propensity to exit the water and clamber around on land. How did the first tetrapods change their newly invaded environment? I asked my co-authors, in which species would they really like to study ecological intraspecific effects? What if there were absolutely no logistical, ethical, or practical constraints? And they had a diversity of responses, from the realistic to the ridiculous, ranging from Darwin’s finches to Tyranosaurus rex, and from microbes to orcas. As a student in the field plant community ecology who uses functional traits to infer patterns of community assembly, the concept of intraspecific variation is continually frustrating and intriguing. This study convincingly lays out the intraspecific effects compared to the species effects along trophic levels such as direct consumption interactions. Do you have a sense for how intraspecific variation might compare to interspecific variation in horizontal communities (i.e. communities of species that compete at the same trophic level, such as herbaceous plants)? Hi Leila and thanks for your question! To rephrase, you are wondering if any of the studies we looked at explored intraspecific effects on other species at the same trophic level. For example, through exploitative or interference interspecific competition. You’re right to conclude that very few studies looked at ecological effects of other species at the same trophic level. Perhaps an exception is omnivorous fish, like guppies, which eat algae and zooplankton. Given that zooplankton also eat algae, you could argue that in some cases guppies and zooplankton sometimes occupy the same trophic level. The short answer is, not that I’m aware of (at least in our dataset), although I’m less familiar with the plant studies. For me, this raises a number of interesting questions about resource partitioning and portfolio effects. I'd love more plant-focused ecologists to weigh in. I think the best model for such research is some useful and easily cultivated species, like Internecivus raptus O'Bannon, Shusett, 1977 aka Xenomorph sp. (Scott, 1979). Thanks for this really interesting study. As you wrote in the discussion and "from looking at the graph", the effect size between different variants of intraspecific variation did not really differ. I would have expected that the effect size of e.g. intraspecific variation measured between population is larger than intraspecific variation within populations. As I would guess that the extant of intraspecific variation is larger between populations than within a population. Of course, your sample size is not large enough to really explore this point. What is your expectation of how the different variants of intraspecific variants effect ecological patterns and do you expect that this is consistent between species and study systems or that like the "extant of intraspecific variation needed" to cause an ecological effect is more or less species or system specific.